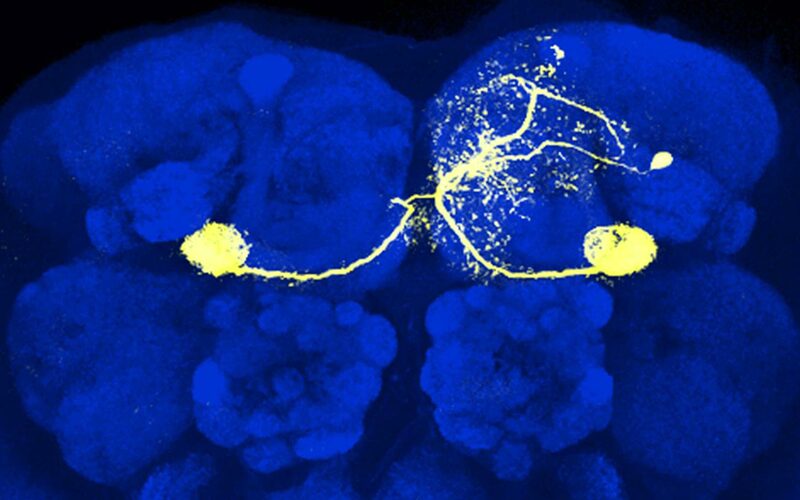 A single dopamine neuron (yellow) in the mushroom body of the fruit fly Drosophila. Glenn Turner and colleagues trained flies to avoid certain odors by pairing them with stimulations of dopamine neurons signaling punishment. They found that this form of associative learning is driven by changes in synaptic strength between mushroom body neurons that process odors and downstream neurons that generate behavioral responses. Cold Spring Harbor, NY — Scientists at Cold Spring Harbor Laboratory (CSHL) have resolved a decades-long debate about how the brain is modified when an animal learns. “We showed something that people have been hoping to see for a long time,” says the team leader, CSHL Associate Professor Glenn Turner, “and we showed it quite definitively.” The results appear online today in the journal Neuron. The research described in the release was supported by the National Institutes of Health, the Howard Hughes Medical Institute, the Japan Society for the Promotion of Science, and the Uehara Memorial Foundation. “Heterosynaptic plasticity underlies aversive olfactory learning in Drosophila,” appears online December 2, 2015 in Neuron.
. The authors are Toshihide Hige, Yoshinori Aso, Mehrab N. Modi, Gerald M. Rubin, and Glenn C. Turner. The paper can be viewed at http://www.sciencedirect.com/science/article/pii/S0896627315009824.